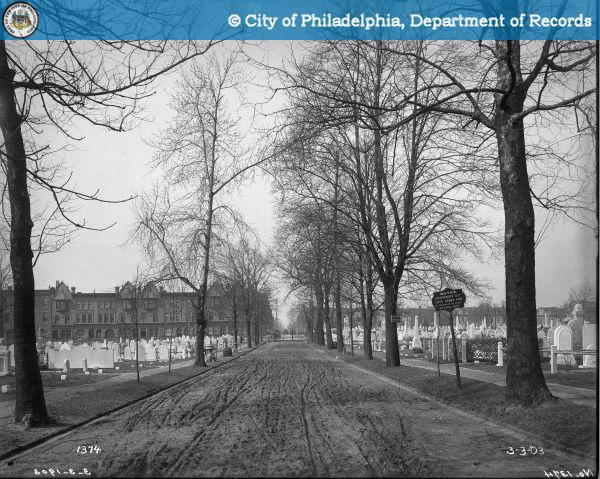 Posted on April 10, 2012 by David H.
There used to be an enormous cemetery right in the middle of what is now Temple University’s main campus in North Philadelphia. Filled with bodies and lined with trees, it stretched from its entrance at Broad and Berks all the way over to just about 17th Street – its northern boundary was Norris Street, it dipped south nearly to Montgomery Avenue, and it is nearly all gone today, covered over by pavement and playing fields, with some buildings that have been built there, too, and also evidence, that very few notice, of what was there before. Those remains, all that remains there now, so far as we are aware, of that cemetery are two trees and a wall that hundreds if not thousands of people walk by everyday, not knowing what they are. Monument Cemetery was founded in the late 1830s, before the extension north of the lines of Philadelphia’s central grid. Those grid lines, from Front Street westward – Second, Third, on up, were laid out by Thomas Holme, William Penn’s surveyor, in the 1680s and imposed a European sense of order on the wilds of the new world. Initially constrained by the limits of South Street to the south and Vine Street to the north, those lines later extended outwards, and now dominate North Philadelphia (and South Philadelphia, too). But Monument Cemetery was built to a different set of angles – right ones coming off of Ridge Avenue, which lies to the south and to the west. And its angles never quite fit with those that came along later, it always maintained its old fashioned skew, its borders were at a different angle from its beginning until its end. Though it did get clipped by Holmes’ lines, it held on to its diagonality, with borders running Baroquely along their ways. One border ran at roughly a 45 degree angle connecting Broad Street and Norris Street and another went along a similar angle from just east of 17th Street up to Norris – those borders, these two, are still there as property lines that you can see just southeast of George Washington Carver High School of Engineering and Science, and that you can walk along just southwest of the houses at, on and near the corner of Broad and Norris. This was a very different place when the cemetery was established. In 1839 as Daniel Bowen wrote in his History of Philadelphia, Monument Cemetery was “sufficiently remote to prevent the apprehension that it may ever be encroached upon by our growing population”. This part of the county was rural, but not too distant. It was far enough away from the city to provide a country tone to the cemetery, however, it was still close enough to the city to allow people to walk there “without experiencing a sense of fatigue”, as Bowen put it. And people would walk there – not only to visit passed relatives and other loved ones, but also to admire the landscape. Hundreds of trees were planted there, and a variety of shrubs and other lower growing plants were there – flowers, evergreens, it would have been verdant even in winter. The broad undulating landscape stretching out, carpeted with grass and green, spiked with trees and shrubs – it would have been a beautiful pastoral. By the 1840s, it was already being drastically altered – as Wellington Williams notes in his 1849 Hand-Book for the Stranger in Philadelphia, Broad Street had been lowered by 8 to 10 feet, thereby effectively raising Monument Cemetery to well above the heads of any passersby. 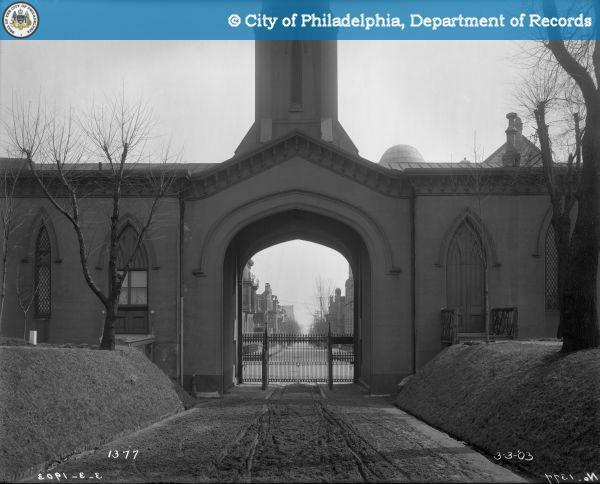 And in the 1870s, streets were cut right through the cemetery – 15th Street, and 16th Street, and Norris Street were opened up “for the improvement of the neighborhood and the convenience of the public” (as per the Philadelphia Reports, 1879). The managers of the cemetery had not buried bodies where the streets were to be, and so graves wouldn’t have had to have been moved, but the lines cut through would have irrevocably changed the uninterruptedly open character of the site. North Philadelphia was no longer rural – the city had arrived. At about this time, McKenzie’s nursery, which had been on the corner of Broad and Columbia (now Cecil B. Moore), was torn down. This nursery had most likely supplied much of the greenery that made Monument Cemetery the beautiful landscape that it was, but the land values would have gotten too high to continue economically justifying an agricultural use for land in this urbanizing district. And so it passed. But Monument Cemetery was still there, its massive gate towering above Broad and Berks, its tree lined central avenue leading west from there. These large trees look quite a bit like American sycamores, though it is very difficulty to tell without seeing the leaves and fruits – however, the rough bark going high up the trunk and the whitish underbark suggests that those trees are American sycamores. There are also, one may notice, smaller trees interspersed among those larger trees. From the photograph, it is impossible to tell what they are. However, if you go there now, to just east of 16th Street, where Berks would once have passed through, you’ll see two tall and thick London planes, about 15 or so feet from each other, oriented east-west, and right next to where the road through Monument Cemetery once was. They are roughly the same size as trees we cored in the yard of the Wagner Free Institute, right around the corner from here, and so are probably about the same age – those ones at the Wagner were over 110 years old, and so those London planes at 16th and Berks probably are, too, and so would have been planted roughly around 1903, and at roughly the same spacing as the saplings in the picture above. It is difficult to differentiate London planes from American sycamores, especially when they’re young, and so it may well have been that the landscape was intended to continue having American sycamores, but London planes were planted instead. But for whatever reason, they are what is there now, these London planes – the only trees that remain from the time of the cemetery. But they aren’t all that remain from the cemetery’s days – the tall wall along Broad Street, going north from Berks, and also south from Berks, is part of the old cemetery walls. If you walk west from that now, the road will slope gently up – the same slope that led gently up as hearses brought the dead and carriages brought mourners here so very long ago. How do we know it’s the same slope as then? Well, trees don’t move much, and so from those London planes that are there now and were here when the cemetery was, they tell us the original grade of the cemetery – and it is about equal with the top of the slope of that streetway currently stretching west from Broad and Berks. There are also walls on either side of that road, but they weren’t there in 1903. Just inside the cemetery gates, where that central avenue sloped down to the Broad Street that had been lowered some 60 years earlier, gentle banks led upwards to the cemetery’s ground level. The walls that are there now, were not there then. The cemetery continued into the 20th century. Into the 1930s, there was still a treelined avenue passing through Monument Cemetery, with scattered trees to either side. And the cemetery walls were still there, as was the cemetery itself. Then, in the 1950s, Temple University was expanding and wanted to expand onto this site. And they did. Bodies were removed, tombstones were, too (to here, for example: http://www.lordwhimsy.com/philadelphia%E2%80%99s-lost-victorian-cemetery ), and yet again the landscape changed entirely, well, nearly entirely. A couple of trees remain, as did the walls that once extended north and south from the cemetery’s main gates at Broad and Berks. But the site is otherwise unrecognizable as the graveyard it once was. Things change, as they always have. Monument Cemetery was established in the 1830s on land that had not been a graveyard before, and through the 19th century, roads were cut, nurseries moved, bodies were buried – and as the 20th century rolled forward, walls were built and the entire, nearly the entire, cemetery was removed. But even through massive change, evidence of the past persists. The trees and wall are still there, borders are still there as extant property lines. Even though you wouldn’t notice it just from looking, the evidence is there, that a cemetery was here. The evidence persists. This entry was posted in Cemeteries, Historic plants, History of landscapes, Nurseries and seedhouses, Plant biology - botany, Trees: biology and history and tagged American sycamore, cemetery, landscape history, London plane by David H.. Bookmark the permalink. Great article. Was Monument Cemetery considered part of the Rural Cemetery movement? “Ah, good question — and a tricky one, too. I’ll paraphrase (for brevity) the remainder of Aaron’s email to say that Aaron mentions that curved lines are one of the hallmarks of “ruralness”, and that Monument Cemetery wasn’t curved, and so there is a discussion one might have as to whether Monument Cemetery is full-on rural. Excellent. Thank you! As a side note, I’ve often wondered if the rural cemetery movement influenced the earliest sections of Fairmount Park. There were no established parks at that point for reference, and cemeteries were the only public landscapes from which to borrow guiding principles. If you go to a place like Lemon Hill today, the way the landscape is designed looks like a rural cemetery (curved drives) without the graves. Aaron recommended Kenneth T. Jackson’s Crabgrass Frontier to me, and so I’ve been reading it, and I just got to a part where Jackson discusses curved roads as being part of the mid-18th century landscape design vocabulary intended to impart a rural flavor to suburban developments, e.g, “More important than the grand avenue in creating a new image for high-status suburban residence was the winding lane” (p. 76) … so perhaps this informed the curves of Fairmount Park? What wasn’t mentioned in this article was that the deceased were supposedly dug up and buried in mass graves at Lawnview, after the city of Brotherly love took that land from the owners because Temple didn’t want to pay the 700,000 the land was worth in the mid 50’s. The headstones can still be seen near the Betsy Ross bridge at low tide, because that is where they were dumped.